It’s been a few weeks since our last look at new arcade businesses opening their doors so let’s clear the backlog and get you up-to-date with the latest venues that will offer new amusements for you to enjoy. There are actually quite a few that I’ve been hearing about since beginning this post so expect it to be full! While I have never met him personally, operator Dean Wenzel and I have done some business together over the past few years as he has been oeprating equipment in the state of Oklahoma. 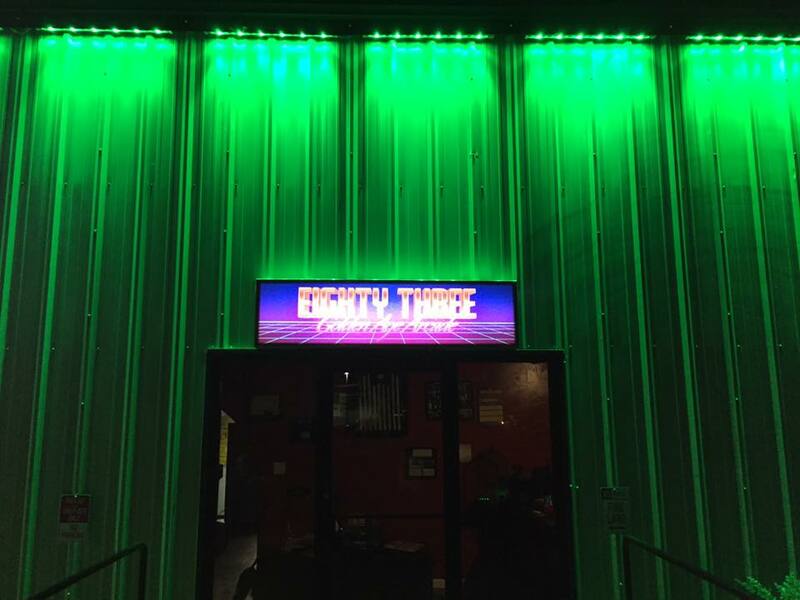 Now Mr. Wenzel is preparing to open the doors for a full-fledged classic arcade by the name of Eighty Three in Tuttle, OK. As the Facebook event page states: “Enjoy Oklahoma’s biggest collection of classic 80’s Arcade games all on Free play.” (The Facebook page for the business itself is here). Some of those classics include: Defender; Donkey Kong; Galaga; Gauntlet; Moon Patrol; 2x Pac-Man; Q*Bert; Space Harrier; Star Wars (Atari, cockpit); Track & Field; TRON and many more that not been revealed yet. It has been common these days to hear about small businesses, particularly bars, rebrand themselves into arcades. In the case of Play Arcade & Bar, it was recently known as The Fish, a sushi restaurant & bar… now, it is an arcade/bar. The reason for the change is that they were having trouble competing with two other bars next door so what better way to really stand out than with some arcade entertainment? The selection isn’t terribly large at the moment but if successful with what they’ve got, expansion is in the cards. Current titles include: Aerosmith pinball; Galaga; Ms. Pac-Man; No Fear pinball; & Target Toss Pro. Read more about it at Bradenton.com. Thanks to JJ Kam for alerting me to this one yesterday. 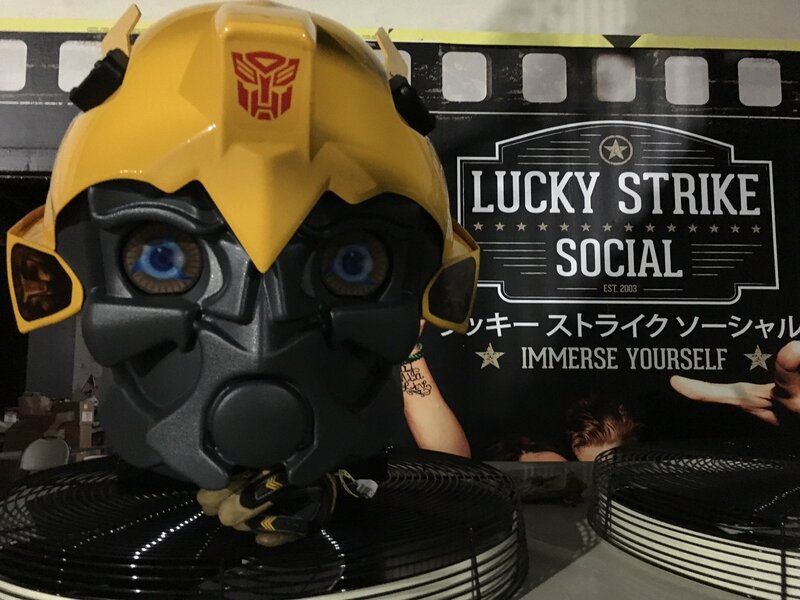 An FEC by the name of Lucky Strike Social is going to be holding their grand opening next week in Honolulu. They are offering what looks to be high-end cuisine, bowling and an arcade. Some of the arcade games that I caught from their feed include: Aerosmith Pinball; Luigi’s Mansion Arcade; MotoGP; The Walking Dead; and Transformers: Human Alliance Deluxe. One picture they posted of a job listing also showed people playing Sega Showdown Attraction but that would have been a stock photo. I’m pretty sure they will have quite a bit more to offer but we’ll have to wait for reports from next week. You can check them out on Facebook here. Main Event is now working on expanding the number of locations they have across the country, not to be outdone by companies like Dave & Busters and Round1USA. They have just opened a new facility in West Knoxville, TN. It includes all of the attractions that you would expect from a Main Event but if you are not familiar with them, those include bowling, pool, laser tag, a rope course, a restaurant and of course, an arcade. Among the video games that they have on-hand, you can find: Aliens Armageddon; Big Buck Wild; Cruis’n Blast; FnF Super Cars; Mario Kart GP DX; Super Bikes 2; Terminator Salvation; Winter X Games Snocross; World’s Largest Pac-Man and more. Some of the ‘more’ includes plenty of redemption games if that is your thing. A story about the location can be found here. Among states that we rarely hear about new arcades opening, Delaware is certainly at the top of the list but today’s post features two locations for the state. Main Event has announced that DE will be receiving a 51,000 sq. ft. facility some time next year. It’s still early and FECs like this never announce game lists but I’m sure it will be similar to the Knoxville location plus any new stuff that we see at IAAPA 2017. One FEC I have heard of before but never visited personally is Scene 75. They have two locations in Ohio with a third in the Cleveland area set to open their doors next week. As an FEC you can expect many attractions including bumper cars, go karts, laser tag, mini-golf, an escape room ‘maze’ and of course an arcade. There is no list of games but we can safely assume a roster of video and redemption games that pull from the latest titles on the market. Scene 75 has also been among those locations to feature multiplayer motion theaters such as those made by Simuline. Cleveland.com has a preview or visit the main website above. This is some pleasant news to hear, given that the state of arcade venues in Japan has been lackluster compared to the West as of late. Bemanistyle reports that a new Taito Station has opened their doors in Tachikawa (Western Tokyo). They have many of the latest Japanese market releases; with Bemanistyle their focus is on the rhythm games such as: Beatmania IIDX; Chunithum; Gitadora, Jubeat; MaiMai; Nostalgia; Pop ‘N Music and more. I would not be surprised if they have multiple NESiCAxLIVe2 setups and they probably will end up showcasing the new VR Game Stage units that the company has been working on lately. They also serve crapes, so bonus if you’re hungry. Japanese-owned Round1 USA continues their expansion across the country, announcing that they are hiring for their first MI location. It may still be a little while before this is open but we’ll keep an eye on it. Going to put these into a separate category for now so that they still get covered but they never have quite the same setup as traditional arcades do. If you are in London and have been waiting to see what all the VR hype is about then DNA VR might be for you. Their official website is here; site friend and contributor Kevin Williams wrote up a review of the facility at VRFocus that you can read here. They are using HTC Vives along with Steam VR but face stiff competition in the coming months as companies like IMAX and Bandai Namco bring their exclusive VR attractions to the city. I mentioned that Delaware was getting some action and the 2nd part comes in the form of a new VR/Arcade called Escape Reality. They offer a variety of VR games in an open space for patrons to enjoy, similar to many others we have seen open a small-scale VR facility like DNA VR above. The article linked to below does spend a bit of time ‘apologizing’ (defending) for VR while attacking traditional arcades for some reason. I was tempted to go off on a tirade about some of the claims they make there but I’ve done that before so let’s leave it at: the two can co-exist but the challenges facing VR/arcades for long-term survivability are much larger than what the traditional arcade has to deal with. Your every day consumer doesn’t know what to expect from a VR/Arcade while they can walk by any video arcade and assume that it will have any number of favorites they are comfortable with like Pac-Man/Galaga/Street Fighter/the latest licensed name/etc. Here’s an article that was sent to me by Kevin Williams about a game company by the name of the Ivanovich Games where they created a VR/AR game where you play a light-gun arcade game within the virtual world called Operation Warcade (a homage to Taito’s old Operation Wolf). Whew! That’s all for now. If you are near any of these businesses then drop by and give them more than lip service – buy a pass or some coins and have fun!